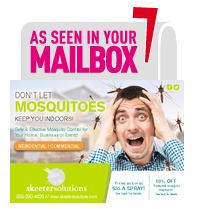 The entire Skeeter Solutions team is committed to keeping your residential, commercial or farm property pest-free. With decades of combined experience, our professionals know where to find mosquito nesting grounds and how to eliminate them quickly and effectively. Mosquitos and other biting insects aren’t just annoying. At Skeeter Solutions, we know how dangerous they can be. Whether you’re planning a special event or simply want to keep your kids, pets and livestock safe during mosquito season, our team of experts can help prevent the harmful diseases mosquitos can spread. We’re located in Daphne, Alabama, and we serve all our local communities. From Gulf Shores and Orange Beach, Alabama to Biloxi, Mississippi and Mobile, Alabama including all the areas in-between, residents and business owners turn to Skeeter Solutions to rein in mosquito populations and prevent the transmission of potentially fatal diseases. The Gulf Coast and Mobile Bay areas are known for heavy mosquito populations during warm weather. Our mild winters and springtime showers make this an ideal breeding ground for these pests. Skeeter Solutions has extensive experience clearing properties of pesky mosquitos so your family, guests and animals can enjoy the outdoors safely. 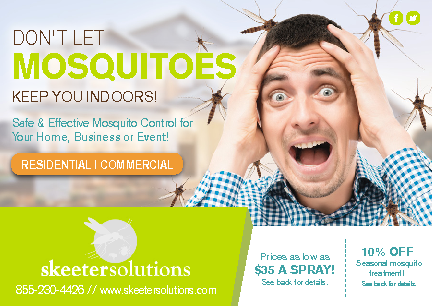 Whether you have a special event coming up or you’re interested in continuous protection against mosquitos and the illnesses they carry, Skeeter Solutions will be there when you need us. Once you call us, we’ll set an appointment to evaluate your property and control your mosquito population that fits into your busy schedule. Each of our technicians is highly trained to find and eliminate mosquitos. We target the areas that they’re likely to reproduce in and the areas they spend time in, including porches and patios, shrubbery and around pools and play areas. In most cases, mosquito breeding grounds don’t just go away. On the contrary, mosquito populations grow exponentially each day. Although it’s never too late to work with Skeeter Solutions, don’t let those buzzing pests keep you from enjoying your outdoor space for one more minute. Call (251) 279-0345 to schedule your appointment with one of Baldwin County’s premier mosquito control services today.